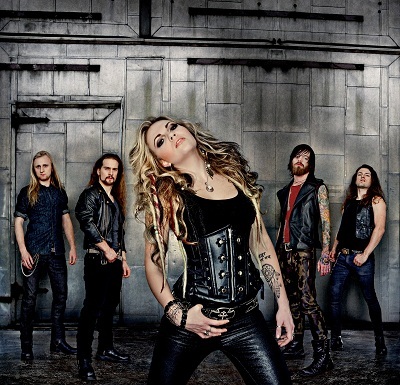 KOBRA AND THE LOTUS – the five-piece group fronted by powerful vocalist Kobra Paige – will release their debut, self-titled album on August 6th 2012 via Spinefarm Records. Produced by Kevin Churko (whose previous credits include both Five Finger Death Punch & Ozzy Osbourne), this 10-track outing has an intentionally grand-scale dynamic, revelling in the glories of the genre and making its mark as arena rather than garage rock; precisely delivered music, still heavy with emotion. KOBRA AND The Lotus – signed to Simmons Records, and released internationally by Spinefarm – will be coming to the UK to guest with both Judas Priest and Guns N’ Roses in late May, then appearing at the Download Festival in June. A second single, ‘Heaven’s Veins’, and more UK dates from the Canadian outfit will follow, in the wake of key European festivals in Spain, Germany, Austria, Sweden, France, Belgium and Italy.